Not only the vegetables but fruits can be grown in containers too. Here are 14 best fruits to grow in pots. 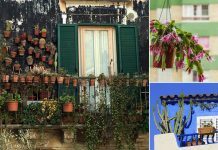 Buy a disease-free potted plant from a reputed nursery or online and start in a small to medium sized pot (3-5 gallons) and then repot the plant gradually into one or two sized bigger pots than the root ball of the plant. 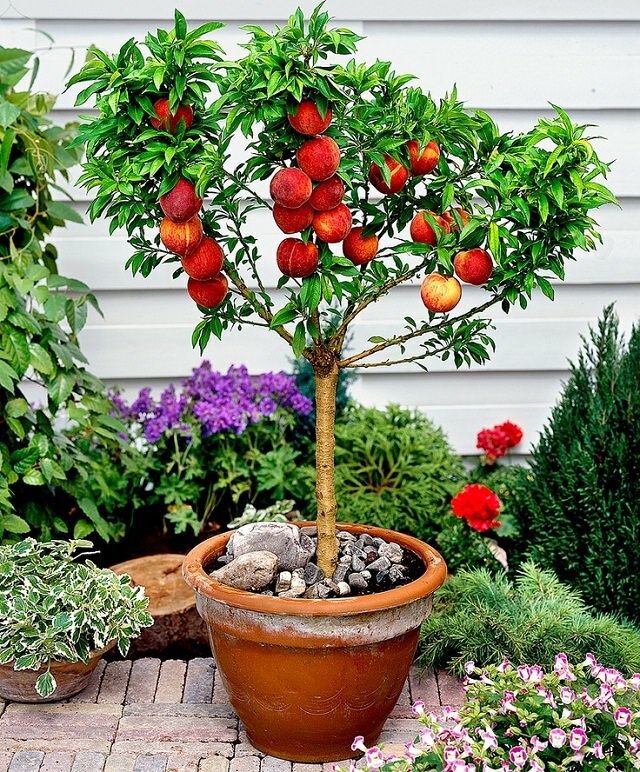 A 20-25 gallon size pot is an ideal one for a fruit tree in the container. 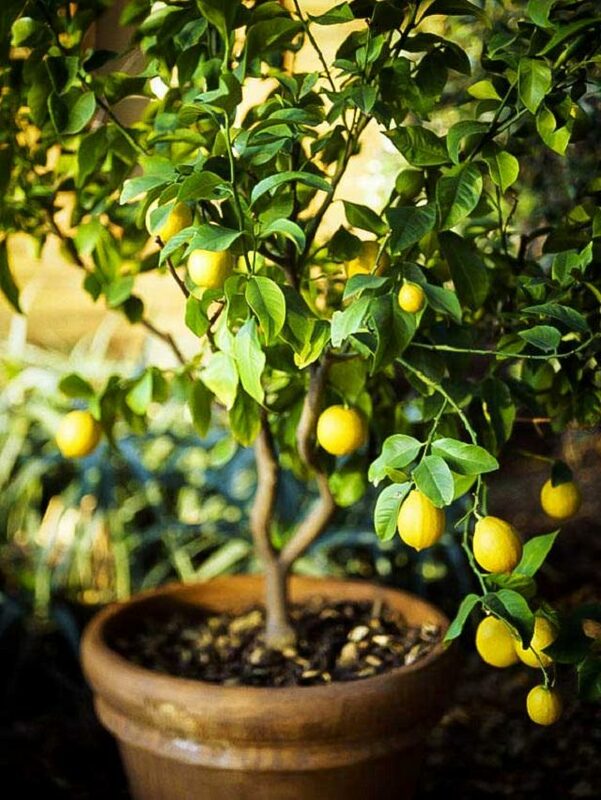 Lemon trees have adapted themselves for container gardening. However, it is tropical fruit, but gardeners in cold climates are also successfully growing this tangy and sour fruit in containers. Almost all the varieties are suitable, but there are some that grows best in specific conditions. 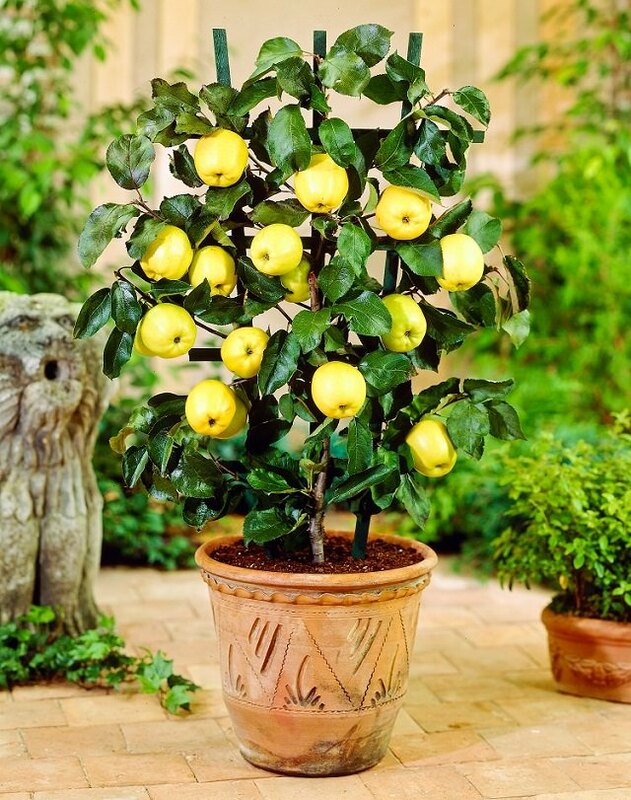 Read the information given in this article to grow your own lemon tree. 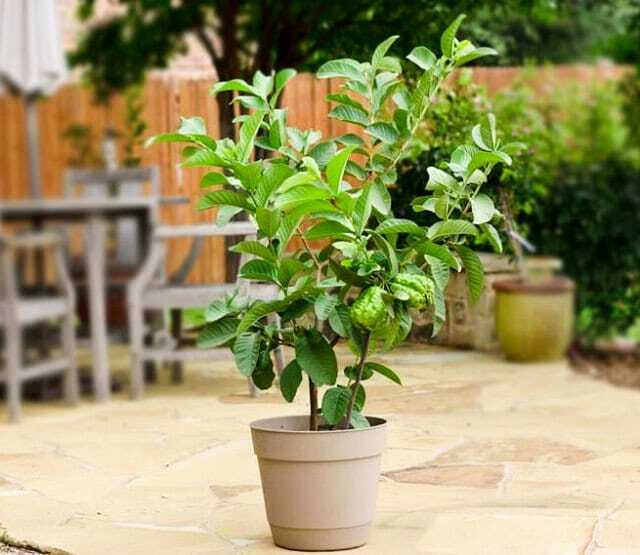 Dwarf apple trees are very suitable for growing in pots, and you can even keep them on a balcony or small terrace. When growing an apple tree in such a small space, it would be better if you choose a self-fertile variety so that you don’t need to grow more than one plant. All the other requirements for growing apple tree in a pot is available here. Pomegranate is one of the juiciest and healthiest fruits and perhaps the easiest to grow in pots because it has a shallow root system when compared to other large fruit trees. If you’ve grown citrus in a pot, growing pomegranates in containers cannot be difficult for you too. 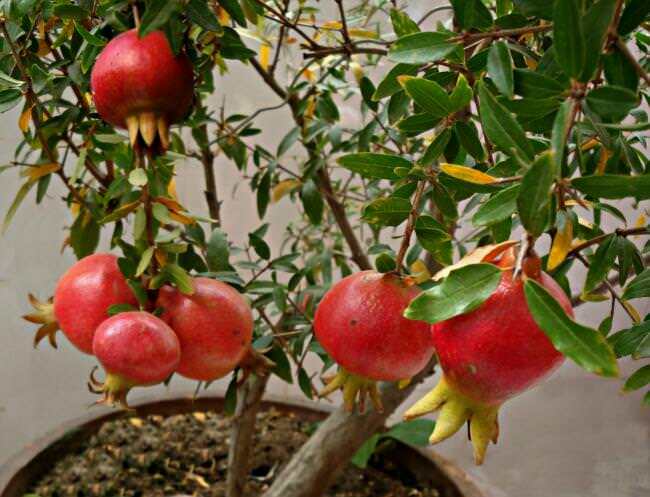 Moreover, pomegranate is more cold hardy and easy to grow. Learn how to grow it in a pot in this article. 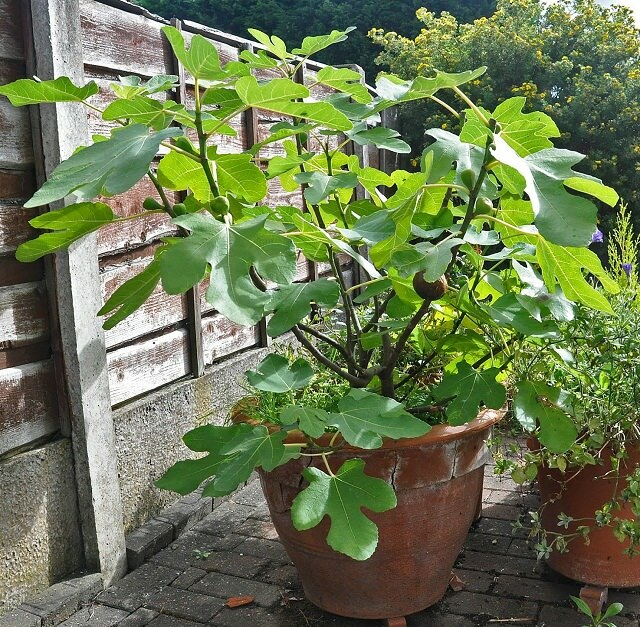 As figs are most suitable for warm temperate regions (USDA Zones 8-10), it is best to grow a fig tree in a pot if you live in a climate where winters are harsh, or you don’t have enough space. 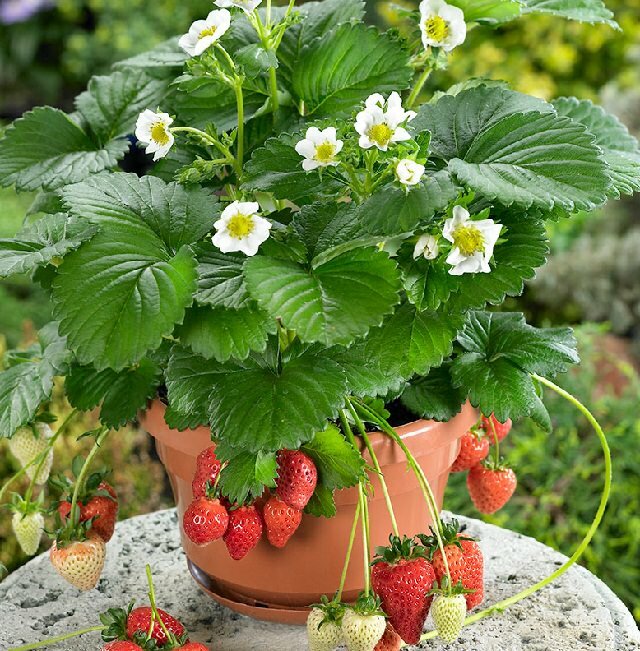 Choose an appropriate variety to grow in a pot and provide plenty of sun to your plant. Regular pruning and fertilization are necessary. Guava tree will delight you with its sweetly scented flowers, delicious fruits, and beautiful tropical appearance. Guava loves the sunny and warm exposure. It is a tropical plant but very much adaptable to temperate climates with moderate winter. Learn how you can grow guava tree in a pot here. 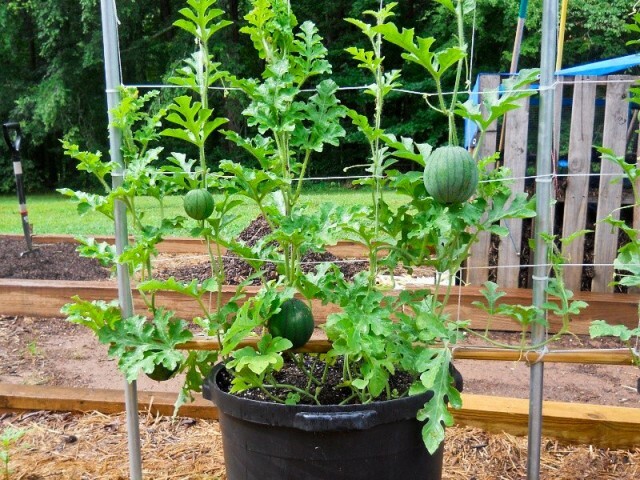 Watermelons are easy to grow in pots, all they need is good support and well-drained potting soil. 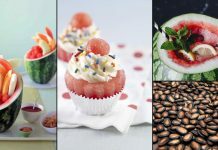 Growing watermelon is similar to cucumber, you can find out all the information in our article. 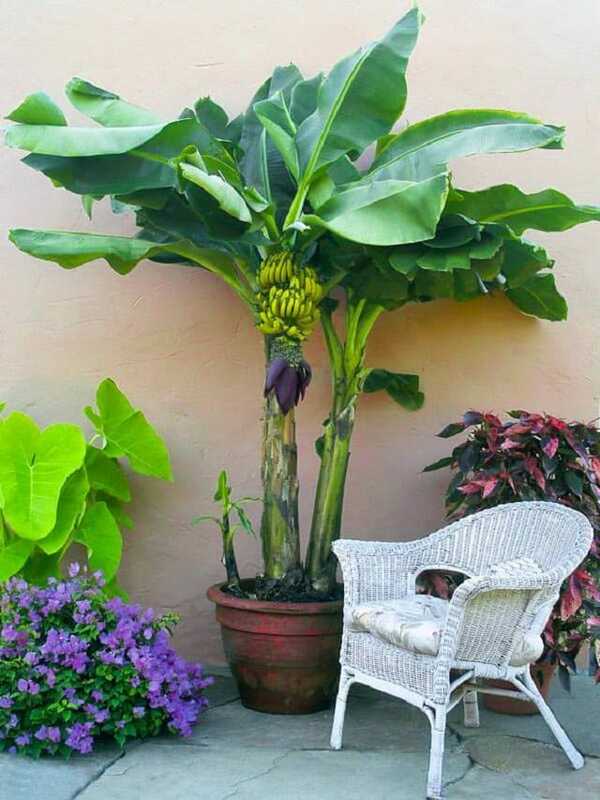 Growing banana in a pot is easy, and its lush green appearance can give any place a tropical look and feel. Banana trees grow in tropical and subtropical parts of the world, and therefore they love full sun, heat, and humidity. However, there are cultivars available that are mildly cold hardy and suitable for warm temperate zones. Learn to grow it in a pot here. 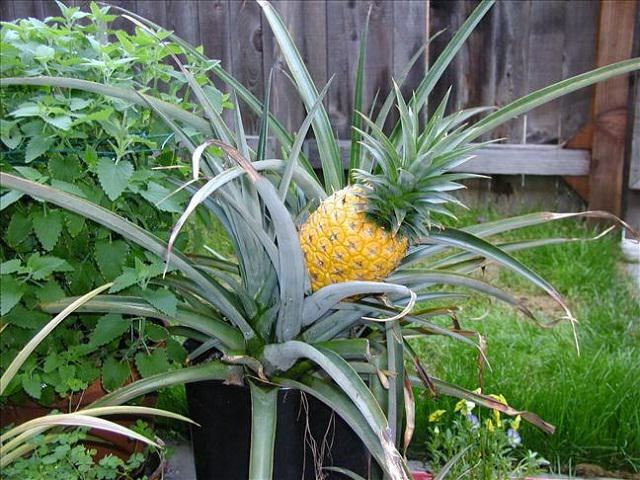 Pineapple plants are small and compact and never grow more than 3-6 feet tall. Also, the plant has shallow roots when compared to other fruit-bearing plants or trees that’s why it is possible to grow them in pots. However, pineapples require consistently warm and humid climate to thrive, but you can also grow them as a houseplant in temperate zones, providing several hours of direct sunlight daily. Raspberries are bit tricky and unruly to grow in containers, but still, everbearing varieties like “Heritage,” “Raspberry Shortcake” and “Fall Gold” are a good choice. All these varieties are self-fertile and easy to grow in pots. 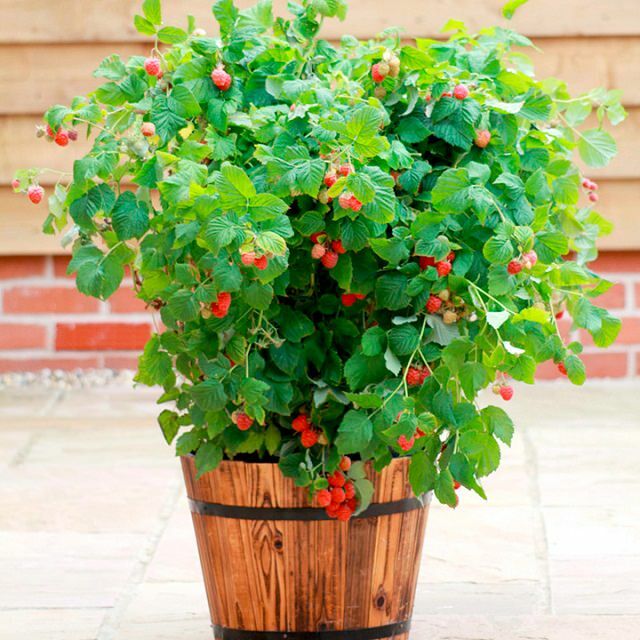 Here’s a useful article on growing raspberry in containers. 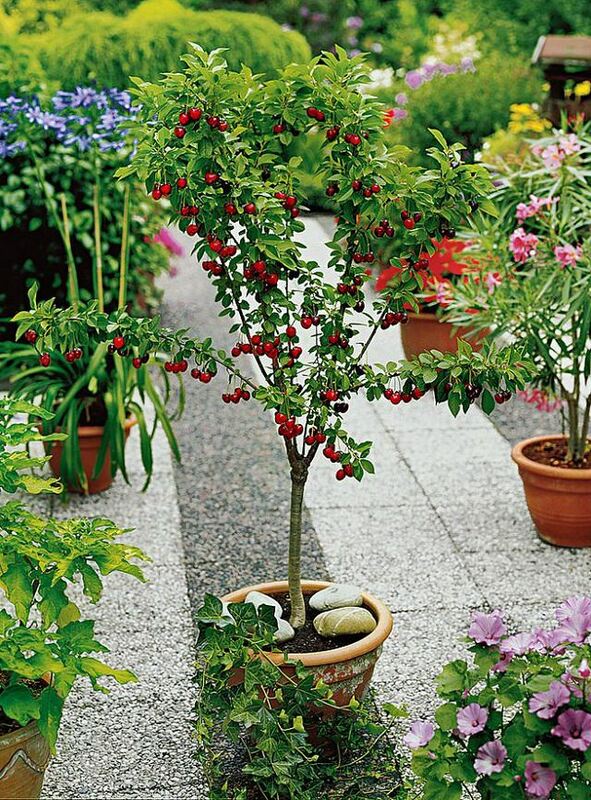 Learn about eight berries you can grow in pots. Growing blueberries in pots is a good idea if the soil in your garden is not acidic. Providing a potting mix for Azaleas and camellias or other acid-loving plants and a large pot is essential so that your blueberry plant will grow easily and provide fruit for years. 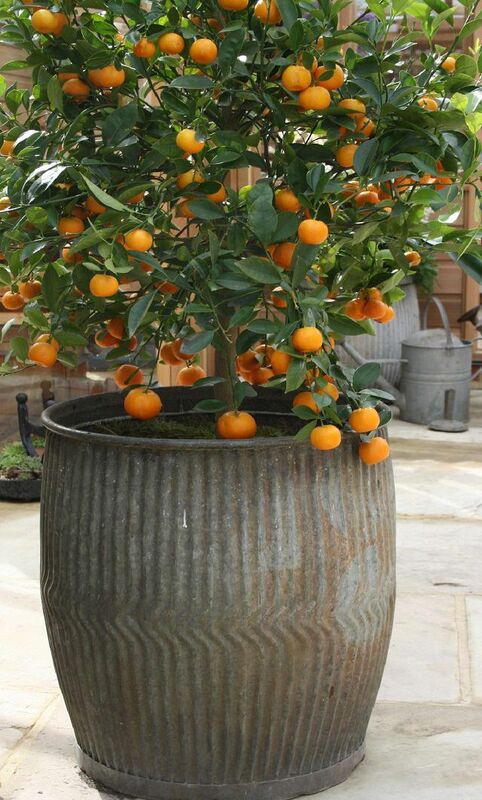 All the oranges and citruses can be grown in pots as they are rather large shrubs or small trees. If you live in a climate where winters are mild, these fruits are really easy to grow. However, you can still grow an orange tree in a cold climate with care in winter. In pots, you can grow calamondin, Buddha’s hand citron, clementines orange, etc. 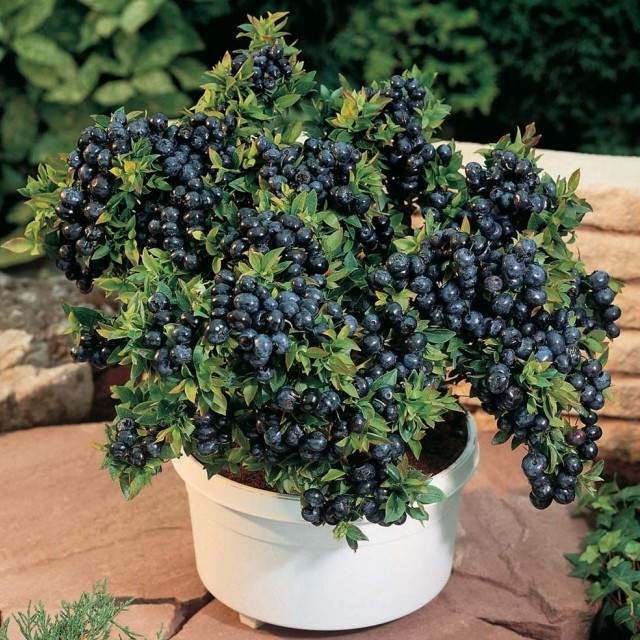 There is mistake in section about blueberries, in the first sentence there is saying “good idea if your soil is not acidic”and in the next that “Providing a potting mix for Azaleas and camellias or other acid loving plants and a large pot is essential”, so what it is actually, they love acidic soil or don’t like it? Hi Elvigs, you seem to have misunderstood the sentence. By “good idea if your soil is not acidic” we meant that it is a good idea to grow blueberries in pots if the soil in your garden is not acidic. We have edited the sentence to make it easier to understand. I misread the first sentence as well. Appreciate the question asked, and the clarification added. Thanks! I would like to grow cherries but live in zone 13. I haven’t been able to locate any varieties which can tolerate this climate. What would be needed for me to grow cherries in pots here? First time I saw banana & pineapple grown in pots! Unbelievable!! I am from Chennai, South India- a metro with only hot & hotter humid climates. Do not really know whether such experiments are possible in water starved places, on roof terraces. Proper guidance most welcome! Pineapple require mild humid climate for the better growth and fruit development. As temperature hit above 38 celcius on summers you can provide slight shade by using nets and maintaining good moisture levels. I want to planting blueberry but I am from Sikkim,it is suitable for grow ? thank you for sharing this wonderful idea.. This is awesome, I HAD NO IDEA you could raise banana, pineapple, fig, (etc.) COOL!!!! Sent your price of your various plan trees in pot as apple,orange,nuts ect. I want to grow fruit trees in pot like a bonsai. I am living in coastal area of Andhra pradesh in India. 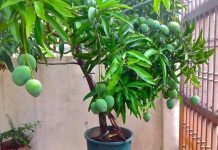 Can you guide me fastest fruit going trees suitable for my area with hot whether. I live in a similar climate and suggest growing: prickly pear, pineapple, pomegranate ,sweetsop(sugar apple), barbados cherry, sugarcane, banana and guava. All will bear within 5 years or less once the soil and water is decent. What’s the minimum size we can use for pots or containers? I would love to know where to get seeds for these varieties of pot friendly fruits? EBAY is easiest, i find everything there. I’m thinking about growing dragonfruit on my balcony. Knowing that they need some good staking for support, would that be good to grow in zone 10? Where do you find what growing zone you are in?? Google it. What climate zone is City,State,Country? How do you find out what growing zone you are in? Nice info liked ur post very much..
Just had a question that i am from Ahmedabad, Gujarat, India & here we have very hot temperature. So is it possible that we can grow blueberries & cherry in this temerature?? I am going to try with limited sun on my apartment balcony. I am zone 8 I think. It’s also fascinating to see people all over the world comment on this! Thanks. We are in Progreso Mesico eith an oceanfront property.. I am determined to have a roof garden of fruit and vegetables even if we are susceptible to high winds and hotntemperatures. Any person try this?